USAID and NREL supported the Office of Utilities Regulation in Jamaica to assess the effectiveness of the Jamaica Public Service Company Limited’s Net-Billing Pilot Program and provide context-specific recommendations for program improvement. A link to the report can be found here. The Caribbean Clean Energy Program aims engage in donor coordination and financing for renewable energy and energy efficiency projects. 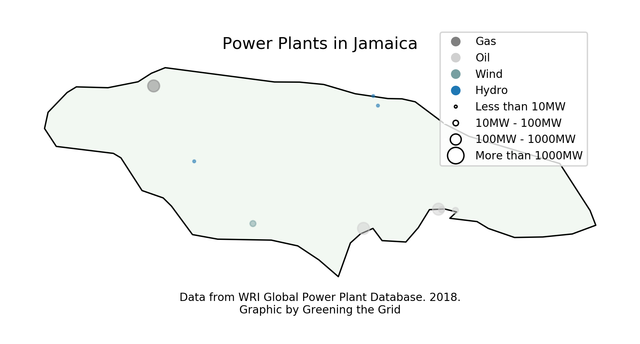 The map below shows the location, type and size of power plants operating in Jamaica.